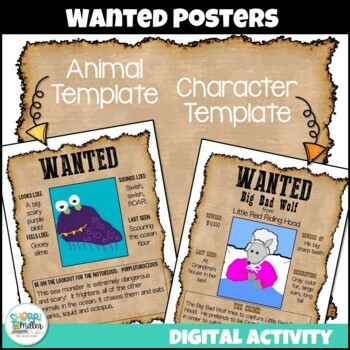 A fun way to learn about characters who are villains or animals/monsters is with a Wanted Poster! This technology integrated lesson includes using a drawing program or online drawing tools to create pictures of your character or animal/monster. 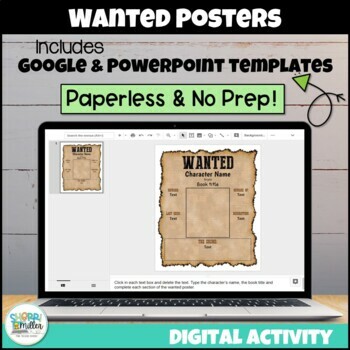 Then inserting them into a PowerPoint slide or a Google Slides template. 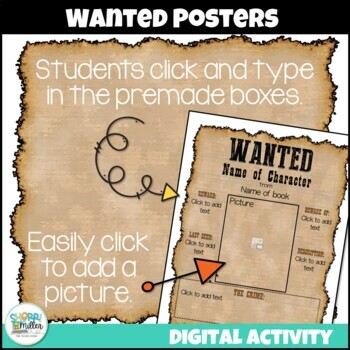 Students add descriptions and the "crime" to the poster in an easy click and type manner. Template includes "locked" items created in the Slide Master to aid in the ease of completing the template. This project has been completed with students as young as 1st grade. 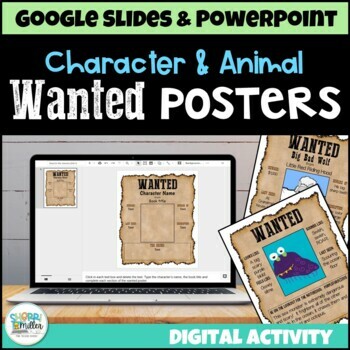 - Character template includes "Reward", "Last seen", "Beware of", "Description" and "Crime" in PowerPoint and Google Slides. - Animal/monster template includes "Looks like", "Feels like", "Sounds like", "Last seen eating" and "Crime" in PowerPoint and Google Slides. Editable Calendar – Click, Type, Print! Editable Forms and Checklists - Click, Type, Print! Created by Sherri Miller. Please rate this product and provide feedback to earn TpT credits good toward the purchase of future products!